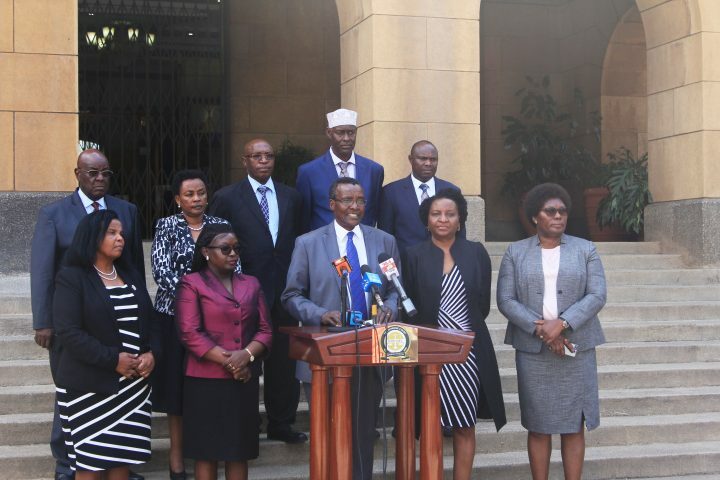 PRESS STATEMENT NAIROBI, March 20, 2019 The Judicial Service Commission (JSC) in exercise of its mandate to promote and facilitate the independence and accountability of the Judiciary and the efficient, effective and transparent administration of justice, in its meeting of March 19, 2019 deliberated on various matters touching on petitions against various judges of superior courts. 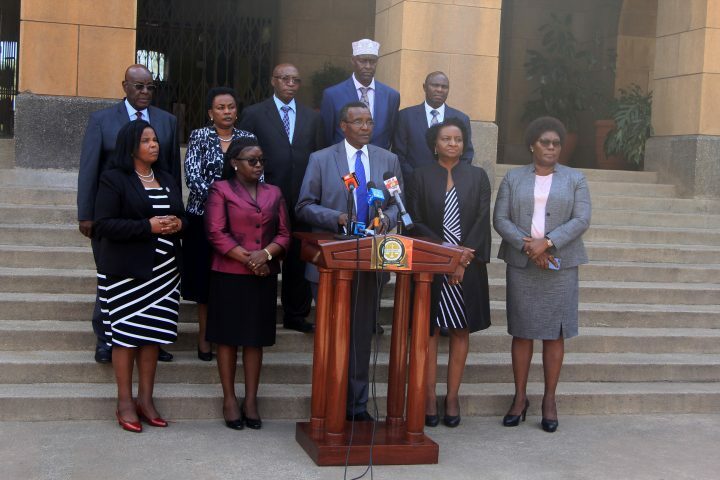 The Judicial Service Commission considered two new petitions, one by Mr Yussuf Ibrahim Dimbil against the Hon Chief Justice David K. Maraga for alleged gross violations of the Constitution and another by Mohamed Mohamud Sheikh against four Judges of the Supreme Court namely Hon Justice Mohammed Khadar Ibrahim, Hon Justice Prof Jackton B. Ojwang, Hon Justice Dr Smokin Wanjala and Hon Lady Justice Njoki Ndung’u for alleged gross misconduct, misbehaviour and incompetence, breach of the Constitution and Oath of Office. Having considered the same, the Commission directed that the concerned judges be served with the petitions and they were given 14 days within which to file their responses to the same. At the same time, the Commission also considered responses to 17 petitions that had been filed against various judges of the Court of Appeal and the High Court. Upon deliberation, the JSC admitted nine of them for hearing and found no merit in the other eight and accordingly dismissed them. 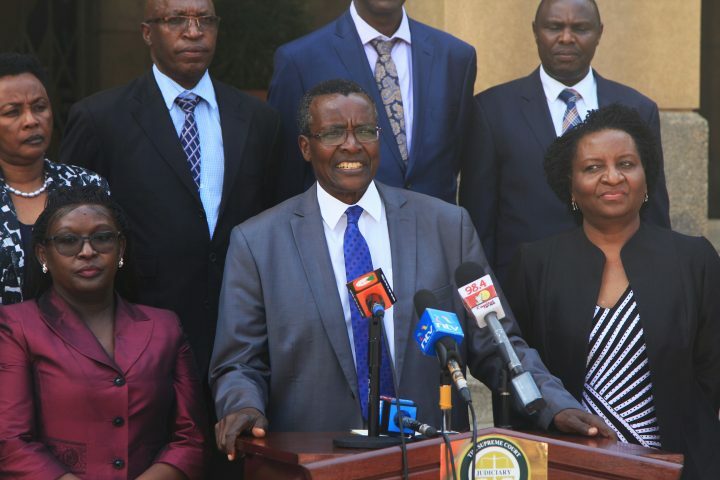 Lastly, the Commission received a report from a Committee of the JSC that had been set up to consider the petition filed by Nelson Oduor Onyango and eight others against the Supreme Court Judge Hon Prof Justice Jackton B. Ojwang. The petition detailed instances which the Petitioners believed constituted grounds of misconduct, impropriety, conflict of interest and breach of judicial code of conduct on the part of the Hon Judge, particularly in sitting (with other judges of the Supreme Court) on application in Supreme Court Misc Application No. 49 of 2014, Town Council of Awendo = Vs= Nelson Oduor Onyango and Others despite being conflicted and being closely associated with the County Government of Migori and the Governor Hon. Okoth Obado. Regrettably, the Hon Judge, despite notice being served upon him refused to attend the hearing. Upon presentation of the report by the Committee, the full Commission deliberated on the same at great length and found that the petition had disclosed sufficient ground to warrant a recommendation to the President to set up a Tribunal for the removal of the Hon Justice Prof Jackton B. Ojwang and accordingly adopted it. The CJ will in the course of the day send the petition to the President.